There are many differences between traditional hard disk drives (HDD) and solid state drives (SSD) including response times, energy consumption, physical makeup, and longevity. 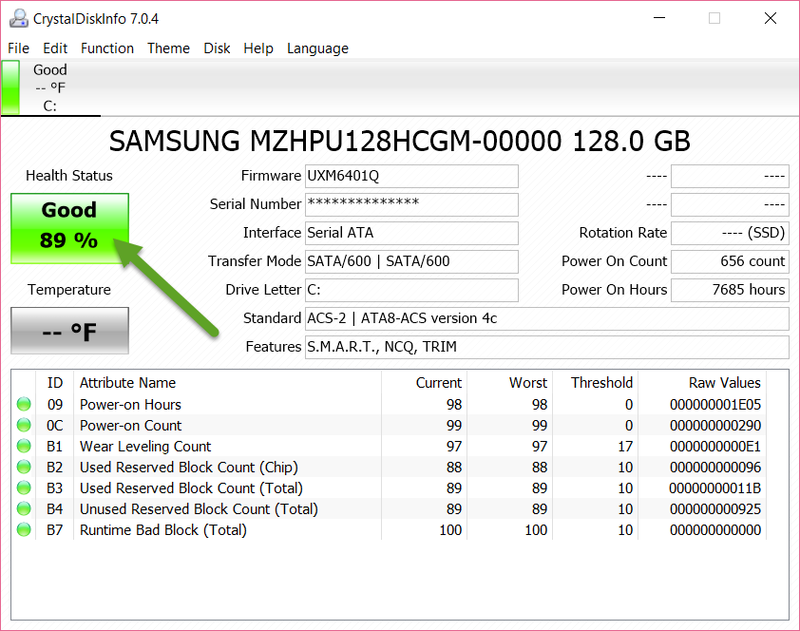 This post explains how to check the life of an SSD and why you should. The more important the data on the device, the more critical it is to check the drive. NOTE: Checking the life of a SSD or HDD does not replace or diminish the need for a working backup solution. The differences in the hardware makeup of hard disk and solid state drives includes the fact that SSD's are built with a lifespan defined by a maximum number of writes. Comparing a HDD to a SSD is similar to comparing an inkjet and laserjet printer. Inkjet printers continue printing when ink gets low, but the quality suffers. For example, red will eventually become pink until the color is hardly visible at all. Laserjet printers continue printing the same quality until there is not enough toner to print, at which point they stop printing. Solid state drives operate much like a laserjet printer, their responsiveness often does not give away underlying issues, they simply stop. A SSD's maximum number of writes depends on many factors, most of which fall outside the scope of this topic. However, if you use a device with a SSD, regularly checking the status of it is critical in order to be prepared for a replacement when the time comes, preventing time and data loss. Drive writes are a measure of data being written such as when files are being saved, when installing software, running updates, and more. The more saves and therefore writes to the disk, the sooner the maximum writes will be used. Using a web browser can also lead to disk writes, for saving cookies, favorites, browser history and more, but in general causes less writes than saving files locally and running software updates. 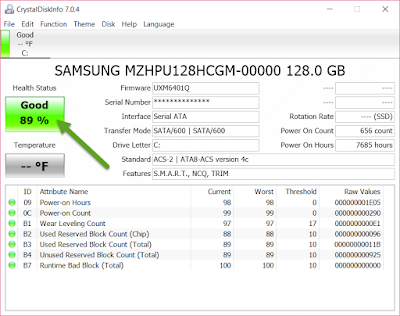 Notice the size of the drive is listed along with many other parameters. Some drives will list the number of host writes while others do not support this. Either way, the Health Status parameter is a decent indicator of the life of the drive. Checking the status of both hard disk and solid state drives is valuable, but knowing SSD's are created with a lifespan defined by a maximum number of writes means it is valuable to check them regularly. Like any computer part, there are factors other than writes that can affect the life of the SSD. Temperature, type of usage, storage environment, and other factors can come into play. Taking 60 seconds to check the status every few months can help prevent both data loss and lost productivity. As always, being prepared, especially when it comes to technology, reduces stress, saves time and is worth the effort! Thank you for your comment, we are so glad you enjoyed the post. If you are interested, here is an older post written specifically about the differences between HDD and SSD's: eyonic.com/1/?C.